Our Maxi Jungle Play Tower makes use of round timbers instead of square, forming large hexagonal towers for a greater surface area, and surrounded with wooden panelling and polycarbonate windows.. 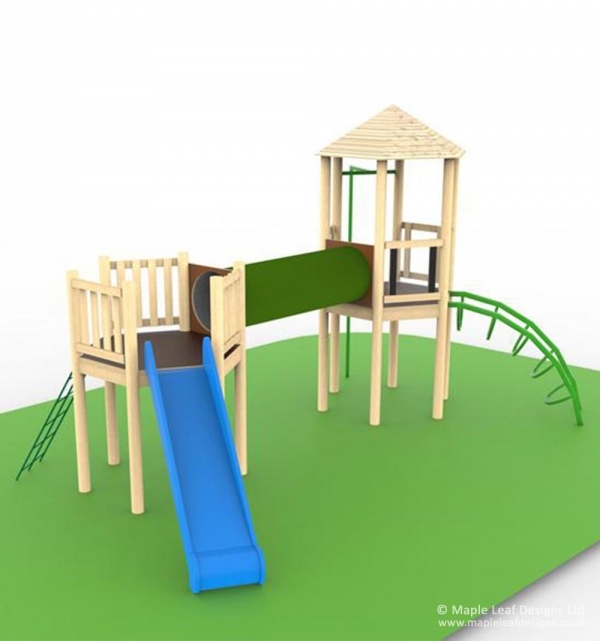 The Maxi Jungle Play Tower features two towers, one with a roof and one without. The towers are fitted with a climbing net, a fireman’s pole, an arch climber, an elevated tunnel and a rotomould slide. As with all of our towers the fittings and orientation can be altered to meet your needs.